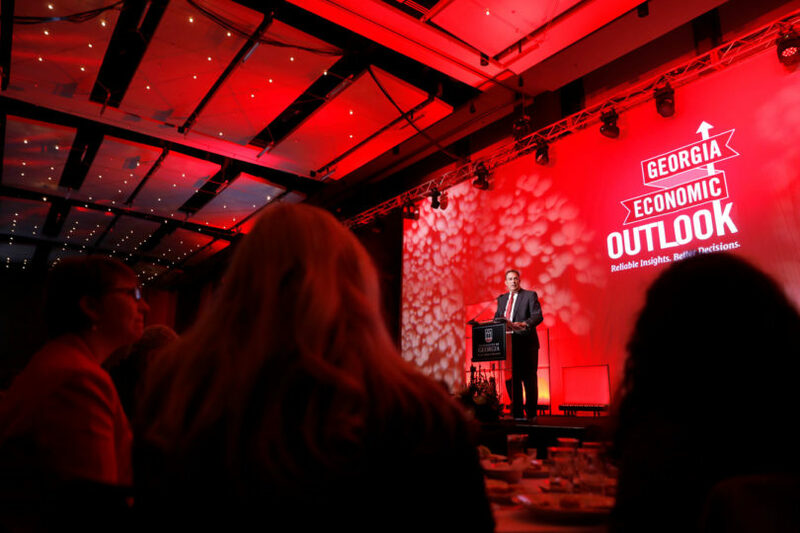 Georgia's economy will match its performance last year, propelled by economic development projects, solid population growth and a housing recovery, said Terry College Dean Benjamin C. Ayers at UGA's 35th annual Georgia Economic Outlook. Georgia’s economy will match its performance last year, propelled by economic development projects, solid population growth and a housing recovery, according to the economic forecast from the University of Georgia Terry College of Business. Georgia’s growth rate will outpace the national average in 2018, he said. The state’s employment will rise by 2 percent, nearly twice the 1.1 percent gain expected for the nation, and the personal incomes of Georgians will grow by 5.8 percent, higher than the national average of 5.5 percent. Ayers delivered the forecast, prepared by the college’s Selig Center for Economic Growth, to an audience of about 600 business leaders, government officials and chamber delegates at the Marriott Marquis in downtown Atlanta. Following the event, the Georgia Economic Outlook series will tour the state, visiting eight cities to deliver local, state and national forecasts. The schedule and ticket information are available at terry.uga.edu/eo. The complete Georgia Economic Outlook forecast is available for purchase online. Georgia’s unemployment rate will fall below 5 percent, slightly higher than the U.S. jobless rate of 4.1 percent—and every metro area in the state will add jobs, Ayers said. Larger shipments in Georgia’s ports and its increasingly important role as a logistics and distributions center, will help the state realize a 3.2 percent GDP increase, a notch above the national average of 2.5 percent, Ayers said. Aided in part by the migration of about 109,000 people to the state, Georgia’s population will grow by 1.5 percent in 2018, outpacing the nation’s 0.7 percent growth. Georgia’s housing market will also be a force for economic vitality, with single-family home starts rising by 16 percent and single-family home prices up 4 percent, on average, over last year, Ayers said. 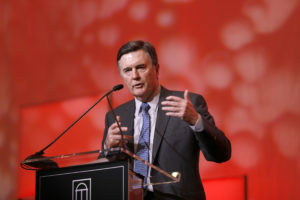 Dennis Lockhart, former president and CEO of the Federal Reserve Bank of Atlanta, delivered the national forecast.